The magical journey of Michelle and James began in the city of Venice, California when Michelle went out for a good time with some friends. A little while into the night Michelle noticed James walk into the bar where they eventually exchanged numbers, only to go their separate ways. A year passed and Michelle found herself unexpectedly wondering about James. Without a last name, she searched Facebook in the hopes of a connection. As luck would have it Michelle found James and messaged him. To her surprise, James confessed he had been thinking of her too, and the rest was history. The proposal was filled with the same warmth and happiness as the day they had met. 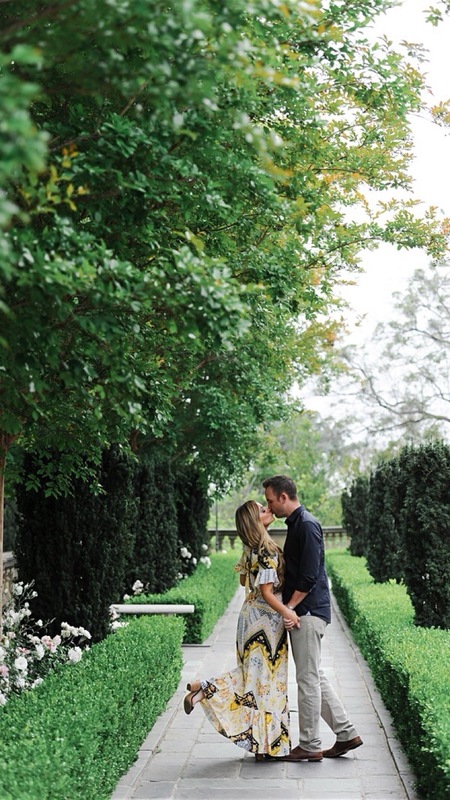 The two traveled to Santa Barbara and before dinner James popped the question that changed their lives forever. While Michelle suspected that James would propose during dinner, James decided to truly surprise her in the private and intimate space of their room, with a bottle of champagne, laughter and joyous tears. “I had finally found him!” Michelle knew she had found the man of her dreams and James knew he had found the woman of his. James proposed with a vintage 3-piece diamond ring on a white gold band, designed by Michelle, and constructed by our on-site jeweler. At Blue Diamond Jeweler we strive to provide our customers with the perfect ring, ensuring that it’s not only meticulously crafted but that your experience is warm and welcoming. We are so happy that Michelle felt so confident in our abilities: “They go out of their way to make YOUR jewelry dreams come true.” With the support of customers like this we will continue our journey to making everyone’s engagement ring dreams come true.